In 4-H, we believe in the power of young people. We see that every child has valuable strengths and real influences to improve the world around us. 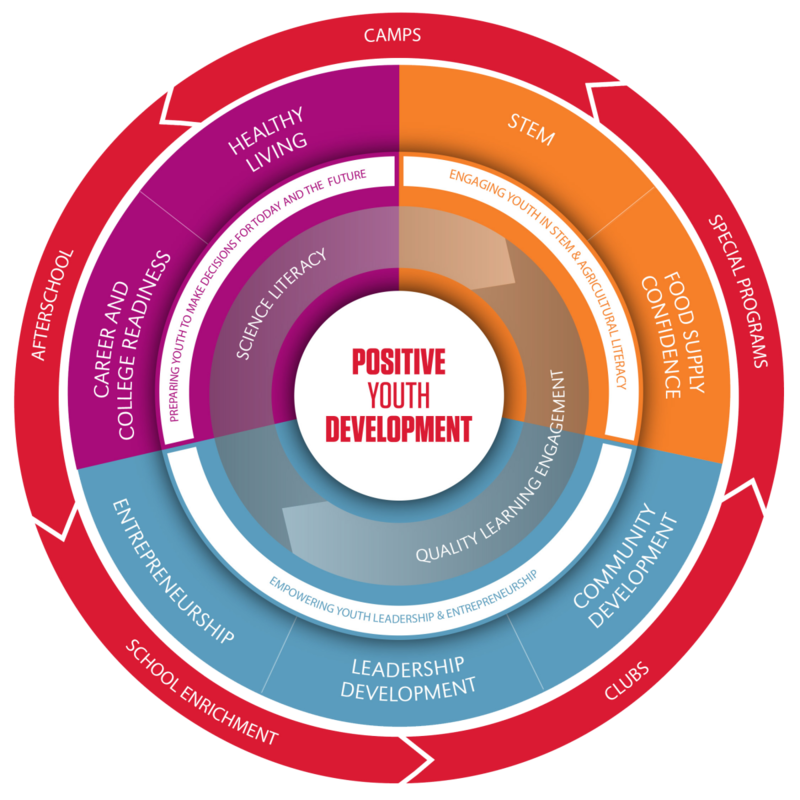 We are America's largest youth development organization–empowering nearly six million young people across the U.S. and 140,000 across Nebraska with the skills to lead for a lifetime. 4-H empowers young people to be true leaders. True leaders are young people who have confidence; know how to work well with others; can endure through challenges; and will stick to a job until it gets done. In 4-H, we believe true leaders aren't born–they are grown. The 4-H experience is proven to grow true leaders with life skills like confidence, independence, resilience, and compassion. Too many of America's youth are lacking the opportunities that prepare them to lead in life and career. They are missing experiences that grow the life skills they need–like confidence, independence, resilience, and compassion. Experiences where they have the freedom to learn by doing, grow from failure, express their ideas, and use their influence to drive positive outcomes. As a result, half of all high school students report they are not prepared to lead in their life after high school–for college or career–and most are unsure about their career path when they graduate. It is a serious problem now that could escalate in the years to come because America needs more true leaders who are prepared and engaged to take on critical challenges facing families, communities, and businesses today. 4-H is delivered by Cooperative Extension–a community of more than 100 public universities across the nation that provides experiences where young people learn by doing. Youth complete hands-on projects in areas like health, science, agriculture, and citizenship, in a positive environment where they receive guidance from adult mentors and are encouraged to take on proactive leadership roles. Kids experience 4-H in every county and parish in the country. The Nebraska 4-H mission is to empower youth to reach their full potential, working and learning in partnership with caring adults. We envision a world in which youth and adults learn, grow, and work together as catalysts for positive change. The phrase "Learning by Doing" sums up the educational philosophy of the 4-H program. Young people learn best when they are involved in their learning. The motto, "To Make the Best Better" is intended to inspire young people to learn and grow, to make their best efforts better through participating in educational experiences. Camps - 4-H overnight and day camps offer recreational, educational, and even career exploration opportunities. Enrollment is not required for participation. 10,000 youth in Nebraska participate in 4-H camp programs each year. Clubs - 4-H clubs are an organized group that meets regularly to focus on a series of educational experiences. Official enrollment is required. 25,000 youth in Nebraska participate in 4-H club programs each year. School Enrichment - School enrichment programs offer non-formal, hands-on educational experiences in classrooms in support of school curriculum. Enrollment is not required. 80,000 youth in Nebraska participate in 4-H school enrichment programs each year. Afterschool - Afterschool programs meet between 3-6 PM to offer youth a safe, fun, and educational experience through hands-on activities and 4-H curriculum. Enrollment is not required unless the afterschool program is also an official 4-H club. 50,000 youth in Nebraska participate in 4-H afterschool programs each year. Special Interest Programs - Special interest programs include short-term experiences, such as workshops or clinics, as well as experiences focused on a single topic or interest. Special interest programs are not part of a school enrichment curriculum and are not restricted to 4-H members. 80,000 youth in Nebraska participate in 4-H special interest programs each year. Clover Kids - Clover Kids are youth between the ages of 5 and 7. Clover Kids may participate in 4-H through a variety of delivery modes, such as clubs and camps. As an enrolled member, Clover Kids may also exhibit at county fairs. Independent Members - Youth who choose not to be involved in a formal 4-H club may still join 4-H as independent members. These youth have the opportunity to participate in their county fair, the Nebraska State Fair, and additional statewide events and events. Watch the video below to learn more about the Nebraska 4-H Framework. Nebraska 4-H is delivered primarily on a local level by county-based Extension faculty and staff. County 4-H programs are supported, in part, by county commissioners and their communities in delivering educational youth programs. Statewide, Nebraska 4-H sponsored by University of Nebraska-Lincoln Extension, a division of the Institute of Agriculture and Natural Resources, commonly referred to as IANR. Nationally, 4-H is part of the National Institute of Food and Agriculture in the United State Department of Agriculture, or USDA. Additionally, the Nebraska 4-H Foundation works closely with Nebraska 4-H through fund generation efforts. Nebraska 4-H prepares young people for successful futures. Educational programs place a strong emphasis on life skills, such as critical thinking, problem-solving, social skills, communication, responsibility, citizenship, and leadership. These skills are fostered through educational programming based on an experiential learning model. This gives youth the opportunity to participate in hands-on learning experiences built around the concept of positive youth development, which is centered on structured out-of-school time learning, leadership experiences, and adult mentoring. View the video below to learn more about positive youth development in Nebraska 4-H. Kids experience 4-H in every county and parish in the country–through in-school and afterschool programs, school and community clubs, and 4-H camps. These 4-H experiences grow young people who are four times more likely to contribute to their communities, two times more likely to make healthy decisions, and two times more likely to pursue STEM opportunities outside of school. 4-H'ers have risen to high points of achievement and leadership in virtually every industry and sector. Including such "true leaders" as Grammy Award-winning singer and actress Jennifer Nettles; Facebook executive and "News Feed" inventor Andrew Bosworth; former U.S. vice president Al Gore; tech guru and founder of Aspera Software Michelle Munson; business leader and CEO of the U.S. Hispanic Chamber of Commerce Javier Palomarez; retired NBA play and business entrepreneur Earvin "Magic" Johnson; and former NASA Chief Astronaut Peggy Whitson, to name a few. To learn more about 4-H in your community or to get involved, contact your local Nebraska Extension office. 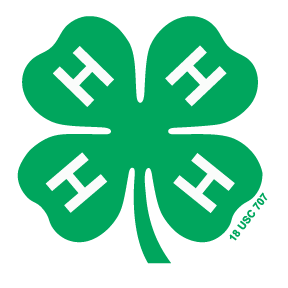 The official 4-H Emblem is a clover with four leaves and an "H" on each leaf. The clover's stem must point to the right as you look at the image. The 4-H Emblem is not a plain four-leaf clover. The 18 USC 707 notice is part of the Emblem. The 4-H Name and Emblem are protected under federal statute Title 18, U.S. Code 707. For more information, please see the 4-H Name and Emblem Guidelines. Head, Heart, Hands, and Health are the four H's in 4-H, and they are the four values members work on through fun and engaging programs. I pledge my head to clearer thinking, my heart to greater loyalty, my hands to larger service, and my health to better living for my club, my community, my country, and my world.